Aaron Wilson of The Baltimore Sun reports that the NFL has hired Sarah Thomas as an official, the first female official in the league’s history. The NFL has had its eyes on Thomas for some time, and she has already participated in the league’s officiating development program and worked preseason games. By the time she takes the field for a regular season game, it will have been nearly 20 years since her career began. "She was in our pipeline for a while," NFL VP of officiating Dean Blandino said in 2013, according to CBS Sports. Thomas is an accomplished official who already holds the honor of being the first woman to ever officiate an NCAA football game, in 2007, and NCAA bowl game, in 2009. But last summer she said she simply wished to be treated not as a trailblazer, but as an official. "Being raised with brothers, I'm just one of the guys, I guess," she said at the time. "I don't try to be one of the guys. I am a female, but I don't look at myself as just a female. I look at myself as an official. With their respect and the respect that I have for them, it just doesn't feel like it's a male-dominated profession." 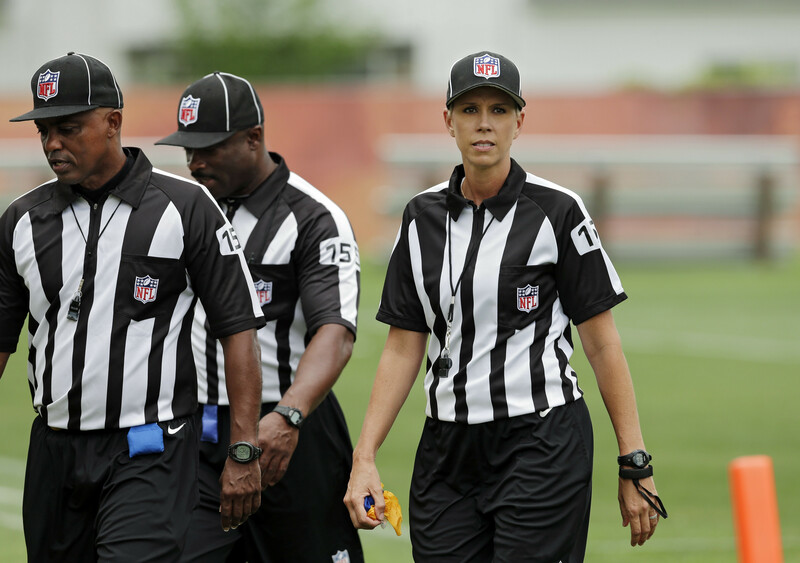 Another woman, Shannon Eastin, has officiated a regular season NFL game before, in 2012. But she was a replacement when the NFL locked out the regular officials. UPDATE -- 1:55 p.m.: Welp.